Dongfeng Race Team leaves the Malacca Strait and enters the Singapore Strait in first place, some 80nm ahead of nearest competitor Abu Dhabi Ocean Racing. The Malacca Strait has a history in the Volvo Ocean Race of taking from the rich and giving to the poor. 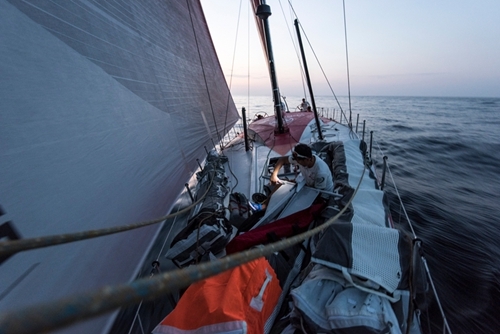 But for Dongfeng Race Team, entering the Strait three days ago in the lead, have officially survived the 600nm transit, today clearing the final hurdle of Singapore and now stretching their legs in the South China Sea. All that is left is 1000 nm upwind. Yee-Haw! The fleet exists the Singapore Strait in a northeasterly, not far from the direction of the finish in Sanya. As they extend on port tack, their next challenge will be to choose their routing for the South China Sea. “Our eyes feel heavy, we are soaked in sweat, the heat really wears us out, and the stress and pressure from the other boats won’t give us any rest,” reports Francisco Vignale on MAPRE. Two main options exist – one, heading up the Malaysian shore line through the Pulau Tioman Islands, or two, through the Kepulanuan Anambas Islands and Raiu Islands spread between Malaysia and Indonesia at the narrowest point. With Donfeng’s lead now appearing unassailable, the race for second is on!